‘Artemis Fowl has constructed a powerful new supercomputer using stolen fairy technology, and the last thing he needs is for it to fall into wrong hands. So, when it does fall into the wrong hands – those of ruthless tycoon Jon Spiro – Artemis knows he must recover the device or the consequences will be dire, for humans and fairies alike. 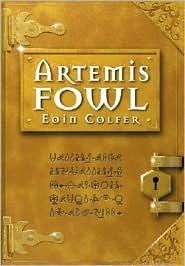 Artemis Fowl and the Eternity Code is the third book in Eoin Colfer’s Artemis Fowl octet. I read this book five years ago, and was in fact, the first full-fledged novel that I managed to read fully which implies that this is the first novel that I read in the octet. I thought this story can very much qualify as a stand-alone, for the reason that I didn’t have any problems in understanding the novel five years ago, but now, after reading it again, I wonder how I managed that. Even if you’re remotely interested in trying the Artemis Fowl series, don’t start with The Eternity Code. The reviews of books; 1 and 2 are available in this blog. 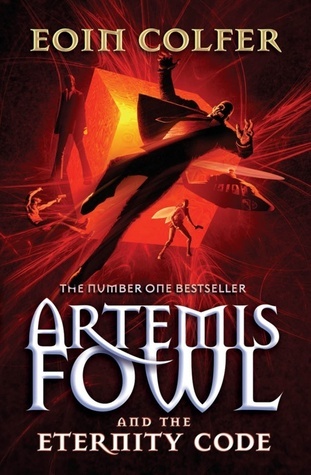 In this, Artemis Fowl has invented a device from stolen fairy technology, the technology he obtained two years ago during the siege of Fowl Manor. C Cube, the name Artemis gave his little device, was far more capable than any device available, to a human. He decides to blackmail an American entrepreneur, Jon Spiro, whose business could be destroyed if Artemis makes his invention commercial. But, Artemis walks right into Spiro’s trap and Butler is fatally injured. Julius Root, realising that fairy technology being in the hands of a person like Jon Spiro could endanger the fairy species, decides to lend Artemis a hand in retrieving the C Cube from Spiro. But, Artemis, this time, doesn’t have Butler with him. The speciality about this book is that Artemis has an opponent who could match up to his level – which was lacking in the previous books. Indeed, there was Foaly and Opal in the previous books but when it comes to the first book, Artemis had planned the entire thing and had an advantage and in Arctic Incident, Opal could’ve been a good opponent but, she didn’t really have a direct confrontation with Artemis and was only keen on destroying Foaly’s reputation. But here, it was Artemis who was caught off guard and he doesn’t have Butler to protect him. The plot too, was structured well. It was balanced and I guess, this is the first time an Artemis Fowl novel has been split in half, the first half being the attack on Artemis and the latter being Artemis’ counter attack. The story of the previous books was good, no second thoughts about it, but they were predictable, especially The Arctic Incident. However, that element was lost, which is something good in an adventure novel. And of course, none of the good things were compromised, and Mulch’s role in this novel is much bigger than that of the earlier novels, which is good news for a Fowl fan who enjoys the series for the humour in it. The only thing that I found strange in this book is the fact that Artemis was repeatedly referred to as ‘fairy public enemy No.1’,mainly because this is the book I read first, and it only talks about how he saved the fairies from the Goblin Rebellion and thereby, he was a good friend to the fairies. First impression is the best impression and Artemis Fowl and the Eternity Code was able to create that first impression. I was never an avid reader of books, I had always loved stories, but I never had the ability to complete an awfully long book. But thanks to the plot, its pace, the dialogues and the concept of this book that I managed to complete the whole book, in just two days – which gave me the confidence to complete long novels. Regarding rating, this would comfortably qualify for a nine on ten however; I’d like to take some more things into consideration before coming to the conclusion. I don’t usually give a full ten on ten unless under the rarest of rare circumstances but this happens to be one of them – for the reason that, had it not been for this book, Astute would not be in existence today. ‘It’s all true, every word. Irish criminal mastermind Artemis Fowl has discovered a fairy race living below ground. He has extorted gold from them and the fairy police have been on his tail for supplying power cells to the goblin gangs. Artemis Fowl and the Arctic Incident is the second book in the Artemis Fowl octet. The Arctic Incident is one year after the kidnapping of Captain Holly Short of the Lower Elements Police; Artemis is now thirteen – a teen. My suggestion to any reader regarding any sequel of any series is to not read the sequel unless you’ve read the previous books. Review of the first book in the octet is available here. Artemis, in the first book, was brought out as an extremely intelligent person with little or no feelings for anyone. 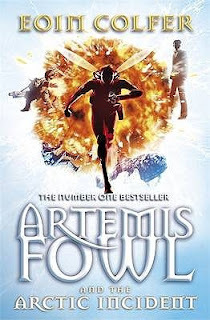 But, the other aspects of Artemis’ life is brought in, during the initial pages of this book, that he too, like any other kid of his age, attends a school (of course, the teachers prefer to not have him) and is worried about his father, missing for the last two years – presumed dead but Artemis gets a lead that his father is held for ransom near Murmansk in Russia by the mafiya. Meanwhile, the situation underground, too, wasn’t a peaceful one. Goblins of the B’wa Kell are leading a rebellion against the fairies but someone is behind them. They had weapons powered by AAA batteries – which implied that a human was dealing with them. The LEP immediately suspect Artemis, the only human who has outwitted them so far, but they soon realise that he has nothing involvement in the goblin rebellion. Instead, the fairies decide to team up with Artemis; with him given the task of identifying the human link in the chain and in return, the fairies would help Artemis in rescuing his father from the mafiya. The author used the sequel very well to build the characters that he had left behind. Taking the case of Artemis, the author begins the book at Artemis’ school, informing the reader that Artemis too, like any other boy of his age, attends school. Also, one immediately realises that Artemis is not just a greedy person but is also concerned about his immediate family members, and to rescue his father, he is willing to undertake any amount of risk. It goes to an extent where he even begins to question himself whether he actually had to kidnap Holly, just for some gold. So, it was enjoyable, how the emotional character of Artemis was being built. Moreover, it was really sad that characters such as Foaly, Holly, Root and Mulch had to be the antagonists, in the prequel, but the truce with Artemis was a highlight and the Holly-Artemis combination was really good, both, with their sarcastic sense of humour. Coming to the plot, it was interesting, moving between different parts of the earth (since world isn’t the appropriate term), which always makes an adventure story better. This book hardly disappoints a Fowl fan in any of its areas, but for the fact that I felt that plot was built like a bubble. Things were moving about gradually, the protagonists’ troubles get deeper, but it was closed so soon, in just approximately thirty pages. However, I’d not say that the finish was in anyway abrupt. I’d rate this book a strong 8/10. ‘Regarded as the world's greatest novelist and literary psychologist, Dostoevsky makes his works readable and enjoyable by presenting the political, social and religious issues of the 19th century Russia. This novel also comes in this line. The plot unravels the story of a poor university student Raskolnikov contemplating long and finally murdering an unscrupulous old pawnbroker for her money. He evades the hands of law, and even justifies his act that murder is permissible to attain a higher purpose and that the old pawnbroker deserves to be murdered. However, with the encouragement of his lady love Sonia, he confesses before law and is sentenced to eight years of hard labour prison. During this time, he realises that true love pervades, and with his release, he undergoes rebirth and resurrection. Crime and Punishment is a supposed psychological thriller novel written in the 19th century by the Russian-Lithuanian author Fyodor Dostoevsky. I’d have never come across this book otherwise; leave alone the thought of actually buying it, but this book was continually mentioned in Ian Rankin’s Knots and Crosses with Rebus narrating the story to Reeve, a story which the latter loves and hence, I thought, I might give it a try. The story features Rodion Romanovitch Raskolnikov, a former university student, who is in a state of absolute penury and pawns his insignificant possessions for a meagre amount. Several events are squeezed into the first hundred pages: he receives a letter from his mother who informs him that his sister is engaged to Pyotr Petrovitch Luzhin, a lawyer based in St. Petersburg and Raskolnikov understands at once that his sister has agreed to this arrangement only to help her family financially; Raskolnikov also meets a man at a tavern, whose life has been ruined because of his drinking habit and narrates his sorry state of affairs to Raskolnikov – his wife and daughter, Sonia, eventually become important characters in the plot; it also portrays Raskolnikov’s reclusive nature , his friendship with the only friend whom he has, Razumihin; and last, the murder also takes place, even before the hundredth page – with Raskolnikov murdering the pawn broker and her sister. The rest of the story is about his delusions regarding the murder and his personal squabbles with his family. It also involves a romantic sub-plot between Sonia and Raskolnikov. I found the entire concept amazing – with the murderer being a protagonist in a crime novel and also, the murderer having nothing more than circumstantial evidence against him. I’d also give Dostoevsky the credit due to him for the way in which he built Raskolnikov’s character during the course of the story with extreme diligence. But for that, there is nothing good to say about this novel. This novel was awfully long but at the same time, doesn’t have any content to fill up those pages. Moreover, it has been written in such a manner that the reader can’t even skim through the content and it was an absolutely excruciating experience, going through the whole thing. Several things in this story were illogical such as, Sonia and Raskolnikov falling in love all of a sudden to an extent where he confides to Sonia, regarding the facts of the murder. The only highlights of the novel were the conversations between the lawyer Porfiry Petrovich and Raskolnikov, how he cleverly forces Raskolnikov to give out several details that he didn’t intend to and also the conversation between Luzhin and his roommate Lebezyatnikov (or whatever his name is). Another aspect, for which the author could hardly be blamed for, nevertheless, it is a hindrance for any reader who doesn’t have much knowledge on Russian history and culture. When I read such things about the book, I didn’t let that bother me much because I always had a feeling that I was reasonably knowledgeable on Russia’s history if not on their culture (I even know to read the Cyrillic script) but I’ve never, ever had a problem with Russian names – be it contemporary politicians or the uncountable large pool of women tennis players and the only name for which I’ve struggled is that of the former Everton winger, Diniyar Bilyaletdinov. But in Crime and Punishment, the names were a way too complicated – I don’t know if the modern Russian names have been made simpler or it is just an awful coincidence that none of the names that I’ve come across have such complicated names. For instance, Raskolnikov’s sister is called Dounia by her close family members and Avdotya Romanovna by others and it was the same case with every other character such as Sonia, Razumihin, et cetera. While I understand that Romanovna is a patronymic, nevertheless, the two different first names are confusing. For those of you who are familiar with the Russian naming system, there is no problem, but for others, it is certainly a hindrance especially, while considering the number of characters in this novel. On the whole, this is a very dull and over rated novel. It took me nearly six months to complete the novel (I had posted in Astute's facebook page, in August, that this shall be the next review) and was reading this worth the time and effort? Far from it. The only suspense about the whole thing was the Raskolnikov ultimately confessing to the authorities after being pronounced innocent but that too, was given away by the publisher of my edition. This was said to be a psychological thriller but I differ. It is just a story about a mad man who just thinks that his personality is similar to Napoleon (Raskolnikov himself compares himself with the French emperor several times). This book doesn’t deserve anything more than three out of ten.